The Ellison Onizuka Kona International Airport is one of the two major airports on the Big Island. The Airport serves most of West Hawaiʻi and receives inter-island, international and overseas flights. The other major airport is on the East coast of the Big Island in Hilo (ITO). You are most likely to arrive at this airport with a flight from another Hawaiian island or with a flight from the mainland. Regardless of your flight time you will really appreciate the very Hawaiian look and feel of this airport. 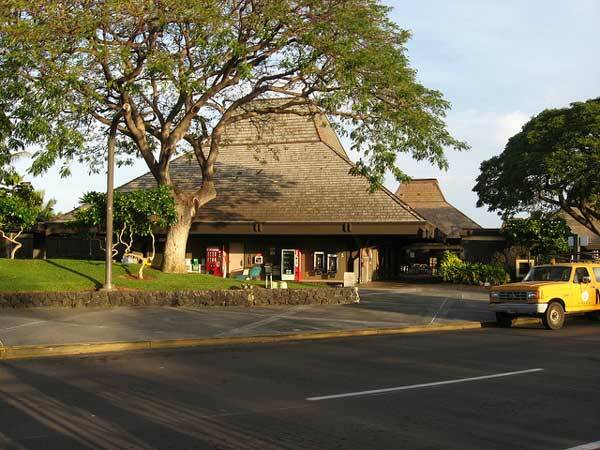 The Kona airport has no large and sterile hallways or multistory buildings, but looks just like a collection of huts and makes you feel at home in paradise immediately! 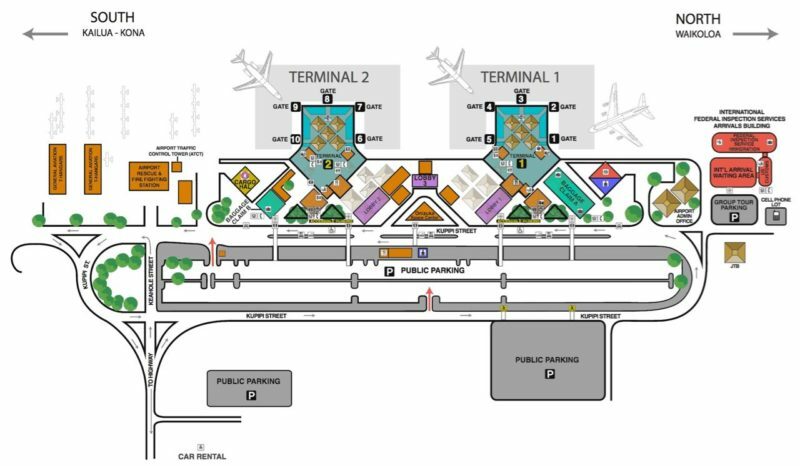 Map of the terminals at Kona airport. Image source: hawaii.gov. You can find the official website of the Kona International Airport here. On January 1, 2017 the Kona airport was renamed “Ellison Onizuka Kona International Airport” at Keāhole to honor fallen astronaut Ellison Onizuka who was born and raised in Kona. Most people that arrive on the Big Island do so at Kona. Renting a car at the Kona airport is easy and convenient, but you should be plan ahead to make sure you get good rates. Most big car rental companies are represented at the airport, as well as some local ventures. You can find their offices in front of the airport (see map above). Local companies often offer the best rates. We recommend to book your car in advance, because the car supply on the Big Island is limited and easily runs out during mid-size and large events such as the Ironman Triathlon and the Merrie Monarch Festival. 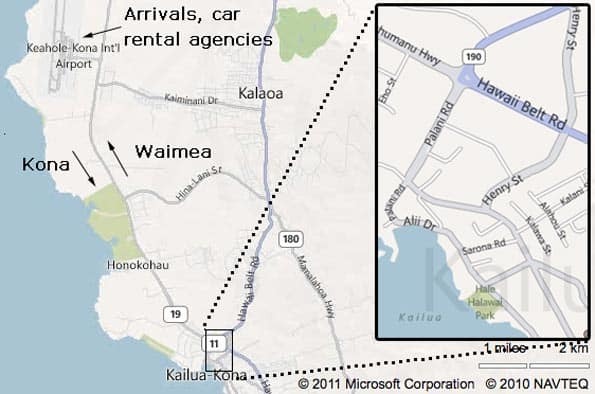 Getting to and from the Kona airport to Kailua Kona: Car, Bus, Taxi or Shuttle? The view of Kona International Airport from the rental car shuttle waiting area, only a couple of 100 yards from the luggage claim. Kona International Airport (KOA) – Photo Credits Ken Lund on Flickr. First of all, the Hele-On bus operates a (limited) service between the airport and Kona (outbound link to hele-on airport service). You can also make use of a shuttle service. Some hotels offer a free shuttle service. If this is not the case, expect to pay between $15 and $30 one way. See the SpeediShuttle website for shuttle services from the Kona airport. Finally, you can call a taxi to get you into town. You can find a list of local taxi providers here. Taking a taxi on the Big Island is expensive, and we recommend to only use them for getting to and from the airport. Using the bus is the cheapest but most inconvenient option, renting a car is by far the most convenient option for local transport. If renting a car is not an option and you are hesitant about using the bus, you can discover the Big Island using tours. Just choose a hotel close to the Kona city center and book your tours from there. Booking a tour often comes with transport to and from the tour location. Did you know that many people on a tight time-budget regret using the same airport to fly to and from the Big Island? Especially if you want to see both the West (Kona) and East (Hilo) side of Hawaii and have less than seven days to spend it is a good idea to arrive and depart from different airports. Have a look at our suggested itineraries if you are on a tight schedule. For example, try flying into Hilo and staying there two days, then get a cozy vacation rental with hot tub in Volcano Village to explore the Hawaii Volcanoes National Park for another two days, and conclude for three days in sunny Kona for great beaches, snorkeling, and much more. This can save half a day and quite some ‘return the car in time’ stress from your itinerary. Most rental agencies on Hawaii allow you to drop off your rental car on the other side of the Big Island without extra fee, but it is best to check yourself.